Another Cold War 1987 scenario. This is set on the Fulda-Bad Hersfeld map. A Soviet division, together with East German NVA (Nationale Volksarmee) support has taken Bad Hersfeld during the prior day. 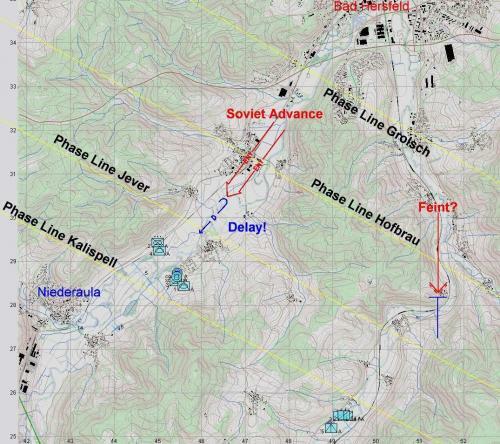 Now that night has fallen, intelligence from headquarters says that a tank company with mechanized support is rolling down the valley toward Niederaula, while a smaller force probes the valley to your east...Unless they're wrong? You lead the battered remnants of the 11th ACR's 2nd squadron. Help is on the way, if you can hold them off long enough. Your opponent has superior firepower, and heavy armor in numbers, but you have superior night vision technology. This is designed to be played as an easy to moderate difficulty cooperative scenario, with a group of 2-4 players commanding various platoons. Much of the action is going to be based on finding good spots for your dismounts and other anti-tank assets to ambush the enemy, and you have recon assets on hand to find those locations. It is possible to play as a single player. Have a plan in mind to deal with unforeseen circumstances.